What does it mean to say that an organism possesses consciousness? The paradigm cases of consciousness all involve mental activities such as observing, believing, thinking, and knowing; sensing, perceiving, and remembering; desiring, wanting, and willing; feeling and intuiting. Consciousnesses is the totality of sensations, perceptions, ideas, attitudes, and feelings of which an individual is aware at any given time. It is by means of consciousness that we become aware of events, their meanings and implications, and plan and execute strategies for dealing with them. Monitoring ourselves and our environment, so that we become aware of the outside world and our relation to it. The monitoring function enables percepts, memories, thoughts, feelings, and desires to be represented in phenomenal awareness. Controlling ourselves and our environment, so that we voluntarily initiate and terminate various mental and behavioral activities. It is through the controlling function that we exercise what the philosophers (and lots of other people, too) call free will or agency. Conscious control is logically related to conscious awareness: Logically, it is difficult to see how we can consciously control things of which we are not consciously aware. Modern Western philosophy began with an inquiry into consciousness. For our purposes, the chief figure in this event is Rene Descartes (1596-1650), a French philosopher who is generally regarded as the "father" of modern philosophy. Before Descartes, in ancient and medieval times, philosophy was based largely on arguments from authority -- whether that authority was Plato or Aristotle, or the Bible and Church Fathers. Plato himself believed that knowledge began with eternal truths, known without benefit of empirical evidence. What became known as scholastic philosophy, as taught by Peter Abelard, Albertus Magnus, Thomas Aquinas, and others during the Medieval era sought to combine the Church's revelations with the natural reason of Aristotle. All this began to change during the Renaissance of the 15th and 16th centuries, and especially in the 16th and 17th centuries, when a new line of philosophy began to emerge, based on the principles of scientific method articulated by Francis Bacon (1561-1626) well as the exercise of reason -- which is where Descartes comes in. (I think, therefore I am). (I am a thing that thinks). 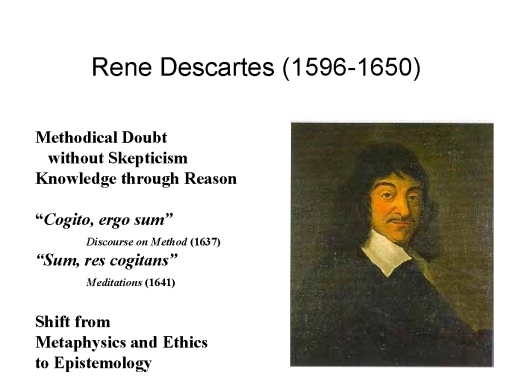 With these inferences, Descartes changed the focus of philosophy from questions of metaphysics (i.e., the ultimate nature of reality) and ethics (i.e., the nature of proper human conduct) to questions of epistemology (i.e., the nature of knowledge). By reasoning that consciousness (mind) was composed of a different kind of substance than physical entities (body), Descartes further set the agenda for philosophical and scientific investigations of consciousness -- and specifically, of the relation between mind and body -- for the next 300 years and more, right up to the present day. Of course, the mind-body problem goes back farther than Descartes. But interestingly, there appears to have been a time when there wasn't a mind-body problem at all -- because, to begin with, there wasn't a mind problem. That is to say, nobody, not even philosophers, were asking questions about the nature of the mind, not to mention the relation between mind and body. An interest in consciousness is apparent as early as the "Golden Age" of Greek philosophy, as exemplified by Socrates, Plato, and Aristotle. 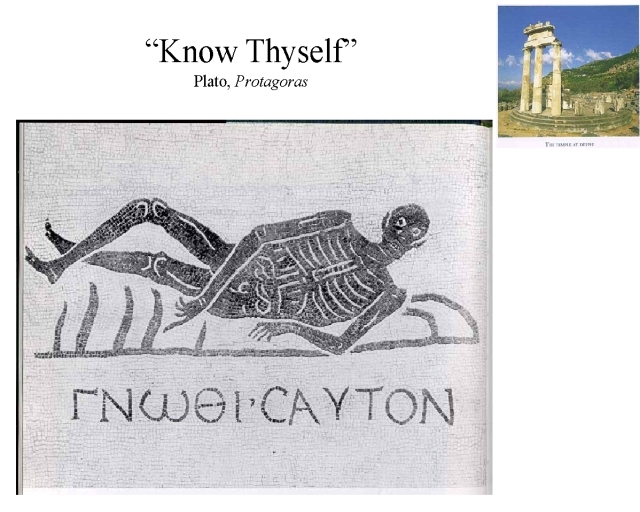 Think, for example, of the injunction to "Know Thyself" carved on the Temple of Apollo at Delphi. 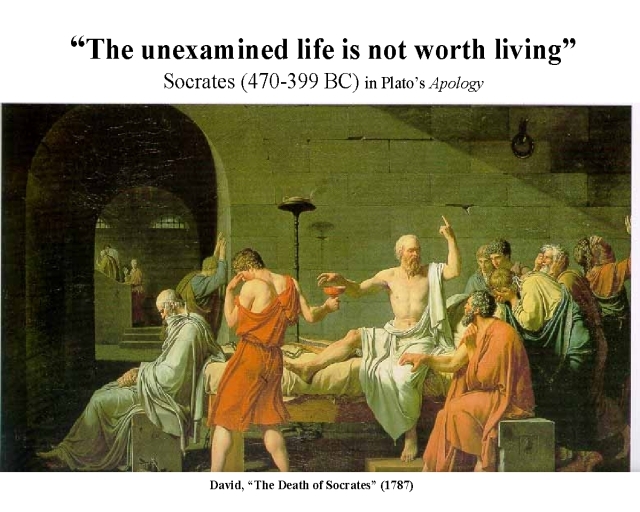 And Socrates' assertion, on his deathbed (as recounted in Plato's Protagoras), that "The unexamined life is not worth living". Questions about the nature of mind continued to be raised among ancient and medieval philosophers of the West, mostly in commentaries on Socrates, Plato, and (especially) Aristotle. So too among philosophers in East. But at least in Europe, until Descartes philosophers mostly debated questions of metaphysics (the nature of reality) and ethics (the nature of good conduct). The philosophical analysis of consciousness as such, and particularly the mind-body problem, really starts with Descartes, at the beginning of the Age of Enlightenment. Philosophy in the Medieval period, roughly the 5th century to the 15th, consisted mainly of commentaries on existing texts. It was generally believed that everything worth knowing was already known, either by virtue of divine revelation (as in the Hebrew Bible and the New Testament) or by virtue of the work of ancient Greek philosophers like Socrates, Plato, and Aristotle. The Renaissance of the 15th and 16th centuries represented not simply a "rebirth" of learning (including the translation of Arabic texts into Latin), and the revival of the Greek spirit of critical inquiry, but also the rise of experimental philosophy, the birth of the scientific method, and a quantum leap in scientific knowledge. Leading figures in this scientific revolution instigated by Francis Bacon, during the 16th and 17th centuries, were Galileo, Kepler, and Newton. While the nature of the universe was interesting in its own right; Francis Bacon argued that "knowledge is power", leading to the development of a bourgeois science tied to capitalist interests in trade and manufacturing. In any event, new scientific discoveries about the universe, the world, and the body further undermined the authority of ancient texts. Mankind is not innately depraved. The aim of life is life itself, not the after-life. The essential condition for the good life on earth is freeing the mind from ignorance and superstition. Mankind is capable of progress and perfection, once freed from ignorance and the arbitrary powers of the state. We can achieve the good life through rational discourse (this is where Descartes comes in), and the scientific method. Everything is interconnected, forming part of the grand scheme of a benevolent Providence (or God as we understand Him). Consciousness is a philosophical problem as well as a scientific problem, and in fact scientists who work on consciousness address empirically the same questions that philosophers ask through the exercise of reason -- and, as Howard Gardner noted in The Mind's New Science, his wonderful history of the origins of interdisciplinary cognitive science, philosophers get to check the scientists' answers! Philosophy for Beginners, by Richard Osborne (Writers & Readers, 1992). Part of the "Beginners" series of documentary comic books, and really good. Hey -- Would you rather I suggest "Philosophy for Dummies"? The Story of Thought: The Essential Guide to the History of Western Philosophy, by Bryan Magee (DK, 1998). Profusely illustrated. The Oxford History of Western Philosophy, ed. by Anthony Kenny (Oxford, 1994). The Oxford Companion to Philosophy, ed. by Ted Honderich (Oxford, 1995). Short essays on everything philosophical. Great bedside and bathtub reading. The Oxford Companion to the Mind, ed. by Richard L. Gregory (Oxford, 1987). While we're at it, short essays on everything psychological and cognitive-scientific. Also great bedside and bathtub reading. Mind: A Brief Introduction (Oxford, 2004). 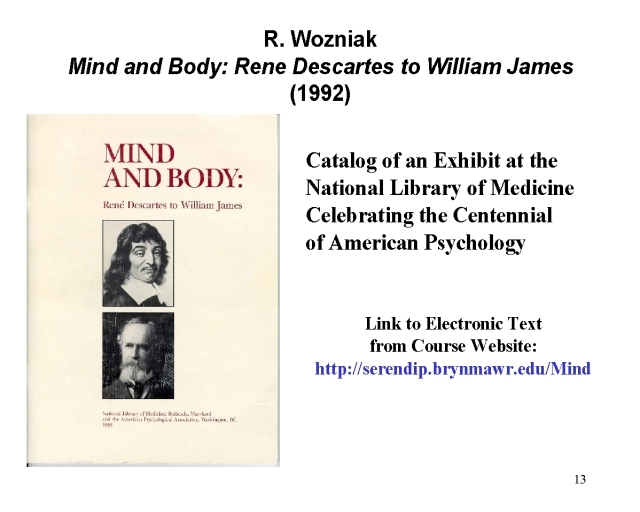 In addition, I highly recommend Robert Wozniak's Mind and Body: Rene Descartes to William James (1992). This absolutely wonderful publication, which is the catalog for an exhibit of historical texts in psychology mounted at the National Library of Medicine in celebration of the 100th anniversary of American psychology, is available on-line at http://serendip.brynmawr.edu/Mind. "the first fact for us then, as psychologists, is that thinking of some sort goes on". Like Descartes, James identified "thinking" with any form of inner conscious mental activity. Thus he included percepts and memories as well as thoughts, and feelings and desires too. "Psychology is the description and explanation of states of consciousness as such". 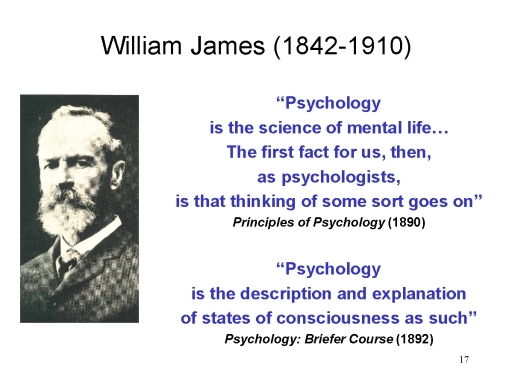 Even before James, and before psychology split off from sensory physiology, consciousness played an important role in psychological theory and research. The sensory psychophysics of Weber, Fechner and Helmholtz sought to trace the relations between the physical properties of environmental stimuli and the psychological properties of the corresponding mental -- that is, conscious -- experiences. Wundt and Titchener devised experimental introspection as the basic technique for psychology. This was not mere uncontrolled self-observation (what Wundt called "pure introspection"), but rather a formal technique involving the use of instruments to vary stimulus conditions and collect responses, as well as analyses that depended on quantitative, not qualitative, data. Wundt, Titchener, and other proponents of the structuralist school defined psychology as "the science of experience as dependent on the experiencing individual", as opposed to physics, which they defined as the science of experience as independent of the experiencing individual. The difference between psychology and physics is the difference between determining how hot water must be to be painful and how hot water must be to boil. By means of experimental introspection, the structuralists attempted a kind of mental chemistry, identifying the elementary sensations and feelings out of which more complex (conscious) mental states were built. Psychology, which had already lost its soul, now lost its mind as well. Despite the hegemony of behaviorism in psychology, interest in consciousness did not entirely disappear within academic psychology. The Gestalt psychologists argued, contra the structuralists, that perceptual experience could not be reduced to sensory stimulation (because "the whole is greater than the sum of its parts"). The very fact that the Gestaltists were interested in perceptual experience meant that they retained an interest in consciousness. Woodworth's research on the span of apprehension asked how many objects could be perceived in a single glance -- that is, how many objects could be present in consciousness at once. McDougall's hormic psychology asserted behavior doesn't just occur in response to stimulation, but that it has a purpose. For McDougall, mental life begins with a cognition (i.e., a thought), continues with a conation (i.e., a desire or a goal), and ends with an affection (i.e., an emotional feeling). These thoughts, desires, and feelings are of course conscious mental states. Hull's drive-reduction theory assumed that all behavior was motivated by internal drive (i.e., motivational) states. Tolman's expectancy theory argued that learning involved the formation of expectancies, which organisms then use for their own purposes. Even in this work, however, consciousness is present more by implication than anything else. Browse through the Psychological Abstracts (known on the Internet as the PsycInfo database) for the behaviorist era, roughly 1917 to 1967, and you will see very few references to consciousness (outside of the literature on Freudian psychoanalysis). Consider, first, the work on selective attention by Cherry, Broadbent, Treisman, and others. Paying attention to something is the act of bring it into consciousness (we'll talk a lot more about this in the lectures on Attention and Automaticity). Or, the work on short-term memory (also known as primary or working) memory by Atkinson and Shifffrin, Waugh and Norman, and others. Short-term memory is the means by which we keep a percept in conscious awareness after its stimulus has disappeared (we'll cover this, too, in the lectures on Attention and Automaticity). And finally, early research on mental imagery by Richardson, Holt, and Sheehan. An image is a percept without a stimulus. Images are part of our conscious awareness, but they are also deliberately generated by an act of conscious will. The cognitive revolution helped legitimize the scientific study of consciousness, but the legitimization of consciousness was by no means inevitable, because there were some important aspects of the cognitive revolution to which consciousness was at best irrelevant, at worst opposed. The computer metaphor model of mind implies that cognition can involve information processing without consciousness playing any role in functioning. If minds process information like computers do, and nobody claims that computers are consciousness, then consciousness isn't necessary for information-processing. Chomskian linguistics assumed that language is mediated by grammatical rules that were inaccessible to introspection, and knowable only by inference. If language is a tool for thought, and important aspects of language processing are performed outside of awareness, then consciousness isn't necessary for thinking, either. At the same time, it has to be said that Chomsky inadvertently legitimized investigation of unconscious processes, inaccessible to phenomenal awareness and knowable only by inference (see, for example, his essay on "Language and Unconscious Processes" in Rules and Representations, 1980). Jut as Chomsky inferred an unconscious Universal Grammar from behavioral evidence, so -- as we will see later -- we can infer unconscious percepts, memories, and the like from subjects' performance on certain behavioral tests. Indeed, in some quarters of modern cognitive science we can find the radical claim, so reminiscent of Watson and behaviorism, that consciousness is an irrelevant fixture of folk psychology that must be swept away of psychology is to become truly scientific. This stance reveals the dirty secret of psychology and cognitive science, which is that many cognitive theorists can get along perfectly well without taking any interest in consciousness at all (once, at a cocktail party, famous cognitive psychologist once proudly reminded me that he had written several books on cognition and memory without ever mentioning consciousness even once). Piecemeal Approach: Cognitive psychologists generally view consciousness as something to be understood in a "bottom-up" fashion -- that if we get a good enough grip on perception, memory, and other topics, we'll finally understand consciousness. The tendency among cognitive psychologists to study perception, memory, and the like without ever mentioning consciousness effectively marginalizes the subject. It's why there are lots of courses and textbooks on perception and memory, and hardly any on consciousness. Epiphenomenalist Suspicion: It's possible to deny that consciousness plays a functional role in behavior, but -- as Descartes discovered -- it's hard to deny consciousness itself. Accordingly, many cognitive scientists view consciousness as the end-product of cognitive functioning -- "the froth on the wave", as John Searle puts it (not that he believes this himself). For an epiphenomenalist, consciousness exists (it's kind of hard to deny it), but it might as well not exist, because it plays no causal role in human behavior. We are conscious automata, but we might just as well be unconscious zombies for all the difference it makes. The difference between conscious inessentialism and the epiphenomenalist suspicion is that conscious inessentialism doesn't deny that consciousness has functional significance. It only denies that consciousness is required for certain mental and behavioral activities. The epiphenomenalist suspicion is the suspicion that consciousness doesn't have any functional significance after all. Conscious shyness is bad news for psychology, because consciousness is our central problem. But paradoxically it is good news for those who want to promote the study of the psychological unconscious -- the idea that conscious experience, thought, and action is influenced by mental states and processes that lie outside phenomenal awareness. The ultimate outcome of the avoidance of consciousness has been the domestication of the unconscious: it's not just for Freudians after all (and, because Freudian theory is wrong in every detail, it's not for Freudians at all!). How can we have an objective, public science of something that is inherently private and subjective? In attempting to address this question, we come up with a number of other questions about consciousness. Spiritualism: can minds exist in the absence of bodies? Parapsychology: can sensation and action occur in the absence of a physical medium for conveying the stimulus to the sensory surfaces? But most philosophers ask only half of the mind-body question, the one concerning the neural correlates of consciousness: how does body cause mind to occur? The other half of the mind-body question is equally interesting: whether, and how, the mind can control the body. Partly this is a question of free will, traditionally addressed by philosophers and now addressed by psychologists as well (some of whom steadfastly deny that there's any such thing). But it's also a question of psychosomatics: can changes in mental state cause changes in bodily state, creating the potential for mind-body healing? Although the mind-body problem is often presented in metaphysical terms, because it deals with whether mind and body are two different types of reality, the remaining problems of consciousness are largely epistemological in nature. What does consciousness entail? Many philosophical debates about consciousness deal with such highly abstract issues as qualia and intentionality. Psychology confronted many of the same abstract problems in Titchener's introspective analyses of the structure of consciousness, and James's psychologizing about the stream of consciousness. Descartes thought that his mind was the one thing he could know for sure, and this assumption set the stage for the structuralists' development of experimental introspection as the fundamental method for the new scientific psychology. But how good is introspection as a vehicle for knowing our minds? How valid are our percepts and memories? Do our thoughts and feelings have any privileged status, or are they nothing more than illusions and after-the-fact rationalizations? Can we actually observe the mental processes by which we create conscious percepts, memories, thoughts, feelings, and desires? In a sense, the entire field of cognitive psychology (and the scientific study of emotion and motivation as well, for that matter), is an attempt to go beyond experimental introspection to determine the architecture of the mind, how mental processes operate within this structure, and how percepts, memories, thoughts, and the like are represented in our minds. Interestingly, for all the weeping and gnashing of teeth about the problems of introspection, cognitive psychology depends intimately, and inevitably, on self-reports. An investigator may be collecting data from button presses on a computer keyboard instead of a clinical interview or paper-and-pencil questionnaire, but the fact remains that if you're doing an experiment on perception, you're asking the subjects to tell you what they perceive, where, and when. Same goes for memory, thoughts, images, feelings, and desires. There's simply no getting around self-reports. The question for psychology, as Fechner and Wundt clearly understood, is how to make a science of them. This course will not provide a complete introduction to cognitive psychology -- to some extent, we assume that you've already had that, at least at the level of an introductory course in psychology or cognitive science. But, because of the piecemeal approach that is characteristic of psychology, that course probably didn't have too much to say about consciousness. In this course, our interest in consciousness provides an overarching context for studying perception, memory, and other psychological phenomena. It is now clear that our introspective knowledge of our own minds is incomplete. In the first place, the mental processes giving rise to conscious cognitive, emotional, and motivational states may lie outside our conscious control. Such processes are often labeled automatic, as opposed to controlled. Research on attention and automaticity suggests that at least some mental processes operate outside of conscious awareness, and voluntary control. In fact, there is some tendency to identify the psychological unconscious with these automatic processes. However, the failure of introspection may also extend to mental states themselves. In psychology, there has been a general assumption that while conscious states -- what we perceive, remember, know, believe, think, feel, and want -- may be generated by automatic processes, mental states (or contents) themselves can't be unconscious. But there is now a large literature that suggests that mental states as well as mental processes can be unconscious -- that is, that our experience, thought, and action can be influenced by percepts, memories, and the like of which we are not aware. This viewpoint is best developed in the literature on implicit memory, but we will see how the implicit-explicit distinction can be extended beyond memory to other cognitive domains, such as perception and thinking, and beyond cognition to the domains of emotion and motivation. This body of research now indicates that it is indeed meaningful to speak of percepts, memories, and the like that are unconscious in the sense that they are inaccessible to introspective phenomenal awareness. In a sense, the question of unconscious mental life returns us to the metaphysical question, of whether there are two kinds of mind -- one conscious and the other unconscious. If there is an unconscious mind, what is the difference that makes for consciousness? The difference between automatic and controlled processes, and between conscious and unconscious mental states provides another perspective on the neural correlates of consciousness. In the case of implicit memory, people may not be conscious of certain memories, but they are still conscious. But we're not always conscious. In sleep, we seem to be unconscious, at least for a while. But dreams appear to represent a peculiar form of consciousness occurring during sleep. Other phenomena of sleep, such as sleepwalking and sleeptalking, also raise questions about consciousness, as does the possibility of sleep learning. While sleep occurs naturally, unconsciousness is induced artificially in surgical anesthesia. In coma, we really seem to be in a permanent state of unconsciousness -- but are we? Even when we are consciousness, we sometimes experience states where our normal consciousness is radically altered. In the clinical dissociative and conversion disorders historically known as hysteria, people can't remember things that happened to them, can't see things that are right in front of them, and can't voluntarily execute certain movements. To some extent, hypnosis provides a laboratory model for these clinical symptoms. Hysteria is very rare, and only a small minority of people are highly hypnotizable, but almost everyone experiences states of absorption and daydreaming, at least on occasion, and individuals who perform at very high levels often experience an exhilarating state of flow. Is it possible to have consciousness without intentionality or "aboutness"? That is, is it possible to be conscious without being conscious of anything? is it possible to regain conscious, voluntary control over habitual processes that have become automatized? And, of course, alterations in consciousness can be accomplished by means of psychoactive -- even psychedelic drugs. Understanding how these drugs operate may shed light on the neural correlates of consciousness. But even without drug research, physiological studies can search for the neural correlates that distinguish various "altered" states of consciousness from the "normal" state. If percepts and memories are unconscious, how do we know they exist? And how would we know whether an individual is in an "altered" state of consciousness? These questions raise the basic question of how we know whether another person is conscious at all -- and, if they are conscious, what they're conscious of. Although we appear to have direct introspective access to the contents of our own minds, at least under some circumstances, our knowledge of other minds is necessarily indirect. We know another person's mental states only by inference. As suggested earlier, the question of the knowledge of other minds is addressed directly by cognitive psychology -- whose task it is to figure out what percepts, memories, and thoughts people have, and how these mental states are structured and processed. The knowledge of other minds is also the province of social psychology, which (especially in the study of social cognition) seeks to understand how we "perceive" other people and make sense of their behaviors. Additionally, developmental psychologists are interested in how children acquire a theory of mind -- the understanding not just that they themselves have mental states. In the ontogenetic sense, this may be reflect the individual's development of consciousness -- an appreciation of mental states as such, and the emergence of the person as a sentient being who not only has phenomenal experiences, but knows that he or she has them. The knowledge of other minds also goes beyond our understanding of other people, and extends both to nonhuman animals and machines. Granted, at least for purposes of argument, that adult human beings are conscious, does consciousness extend to other biological creatures, and if so how far. And does -- or could -- consciousness extend to machines made out of silicon chips (or, for that matter, tin cans linked by string), as well as living organisms made up of cells? Can a monkey be conscious? How about a dog? How about a bat? How about a sea slug? How about a paramecium? Can a computer be conscious? How about a thermostat? How about a rock? How about the Earth, or the Solar System, or the Universe? Some philosophers, psychologists, and other cognitive scientists will tell you that the "hard problem" of consciousness is knowing how brains cause consciousness to occur. That's an interesting problem, but it's not the hardest problem of consciousness. The hardest problem of consciousness is knowing what's on another creature's mind. This page last revised 08/24/2016.